Although Marvel Studios had passed on the option of a movie, it won't be long until the Runaways will be making their way to Hulu. Last year, Marvel thrilled the fan community by announcing that Runaways, a fan-favorite comic book series, would soon become part of the MCU. Although Marvel Studios had passed on the option of a movie, it won't be long until the Runaways will be making their way to Hulu. Filming is due to begin on February 13th, so we've been eagerly awaiting casting news. Finally, Marvel has obliged — and the cast look outstanding. What's more, in addition to introducing us to the cast, #Marvel's announcement confirms that this will be a comic-accurate retelling of Brian K. Vaughan's classic series. 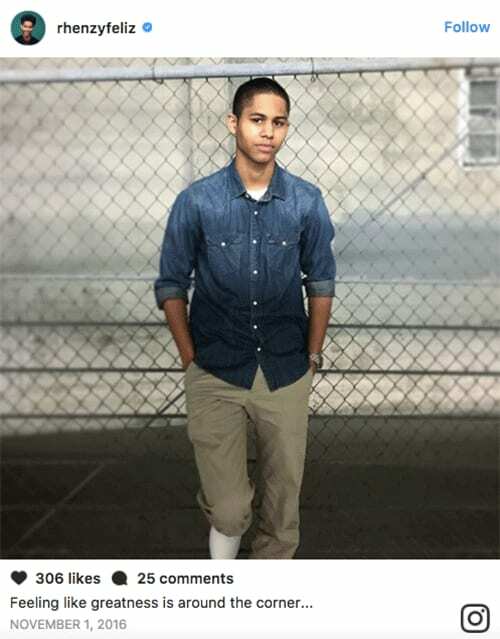 Rhenzy Feliz will be no stranger to Hulu subscribers; he's best known for his tremendous performance in Casual. He's playing Alex Wilder, a character who becomes the default team leader; an out-and-out nerd, Alex views his parents as saints. That belief is shattered when he and his friends stumble upon their parents committing a sacrifice to a demonic race in order to acquire supernatural power, and nobody is more shaken than Alex. If Runaways does instead stick to the classic plot, his story will have a sting in its tail. I'm not going to spoil it here, but let's just say - watch him like a hawk. You might recognize Lyrica Okano from The Affair, but she's also appeared in popular shows such as Unforgettable. Last year she branched out as a producer, heading up her own short, Once A Cheerleader. Now, it seems Lyrica's about to enter the #MCU! 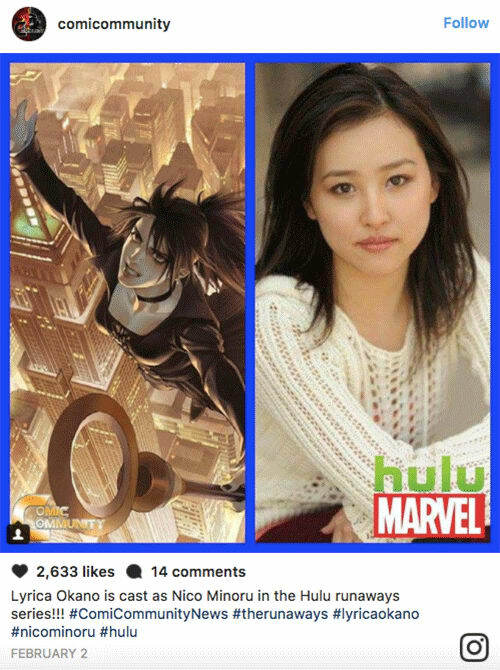 Lyrica is playing the role of Nico Minoru, a much-loved character who gradually became the heart of the Runaways comics. It's going to be interesting to see how Marvel pulls off Nico's background; Linda Louise Duan played the role of her mother, Tina Minoru, in Doctor Strange, but those scenes were mostly cut. That said, we did catch a glimpse of the Minoru family's trademark weapon, the Staff of One, in a featurette. See if you can spot it! Already developing a strong reputation, Virginia Gardner is best known for appearances in Glee, Law & Order: SCU, and Secrets and Lies. She's playing a fascinatingly complex character: Karolina Dean is a beautiful teenager who, unknown even to herself, is a powerful light-manipulating alien. She discovers her true nature, embraces her powers, and soon discovers a lot of truths about herself that even her parents never knew. She's also one of Marvel's most prominent lesbian heroes. A skilled singer and actress, you'll know Ariela Barer best for playing the role of Carmen in One Day At A Time. She's playing Gert, a passionate, fiery social justice warrior whose abrasive exterior is frequently a mask to hide her true feelings. To give you an idea of the potential this character has, in one future comic book timeline she became leader of the Avengers! By the way, did I mention she winds up with a pet dinosaur? 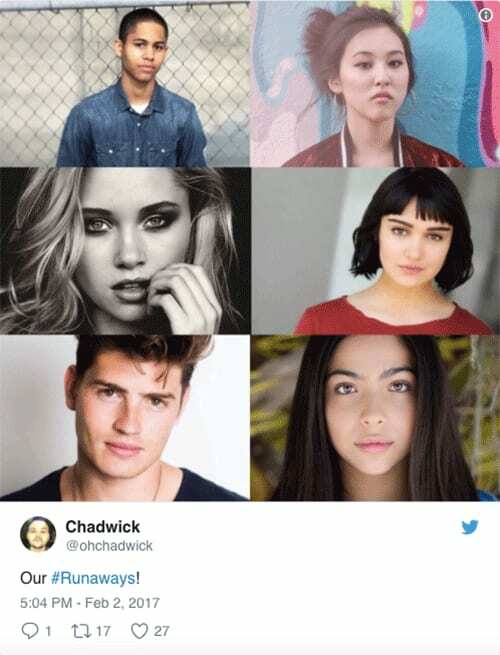 If there's any role Marvel need to get right to make Runaways work, it's Chase Stein! Gregg Sulkin is a British actor who made his debut in 2002's Doctor Zhivago. British fans will remember him fondly for playing Adam in The Sarah-Jane Adventures, while he's most recently played Liam Booker in Faking It. Chase is a brash teen who's inherited his parents' aptitude for machinery. Impulsive and reckless, he tends to dive into the deep end, and this will cause the Runaways a lot of problems. 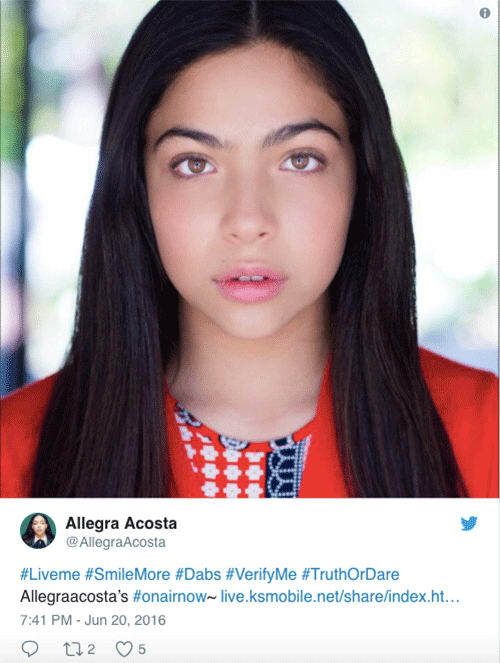 You might recognize 14-year-old Allegra Acosta from 100 Things To Do Before High School, but she's about to enter the big time with Runaways! She's playing Molly Hayes, the cheerful and upbeat kid who longs to belong. In the comics, Molly is actually a super-strong mutant; she's new to her powers, and they tend to leave her tired out, so she often falls asleep shortly after a feat. No doubt Marvel will have to adapt Molly's backstory a little, as they don't own the licence for mutants. Oh, did I mention she's such a tough little scrapper that she once knocked Wolverine flying? So, ladies and gentlemen, these are your Runaways! We've been hearing rumblings about Runaways for years; we were originally going to get a Runaways movie, but The Avengers knocked the film into development Hell. Now, finally, a fan-dream is about to become a reality. One handful of teenagers are about to get the shock of their lives as they learn: perhaps their parents really are evil after all? Read next: Coulson Set To Uncover The Patriot's Secret In 'Agents Of S.H.I.E.L.D.'! 'Rick And Morty' Plot Twist: Will Season 3 Split Up The Family? Bucky Up Your Ideas: Did Sebastian Stan Confirm He Is The New Captain America? Coulson Set To Uncover The Patriot's Secret In 'Agents Of S.H.I.E.L.D. '!